People love to collect objects. Some seek items of aesthetic beauty. For others, the motivation is to gather hundreds of examples of one particular type of object. For still others, the need to collect goes hand-in-hand with scientific categorization and wonder about the natural world. 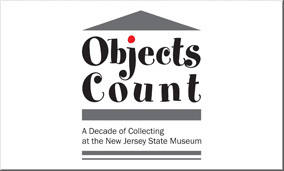 The New Jersey State Museum also collects objects. In this exciting new exhibition, visitors will experience an eclectic selection of artifacts and specimens collected over the past ten years. See a caribou antler from Ice Age New Jersey, a painting by artist Ben Shahn, a 1930s flight suit from a South Jersey female pilot, Native American projectile points and much more. Individually, each object tells a story about the world in which we live. Taken together, they remind us of a basic premise of the role of museums in modern society.